The Fed also removed the 6.5% unemployment threshold for changing rates, saying in its statement that it will "take a balanced approach consistent with its longer-run goals of maximum employment and inflation at 2%." But stocks fell once new Fed chair Janet Yellen suggested that a rate hike could come as soon as early 2015. The Fed said in its statement that rates would remain low for a "considerable time" after the bond purchases end. But in response to a question about this, Yellen admitted that a "considerable time" could be as short as six months. The Twitter universe reacted quickly to Yellen's first press conference. 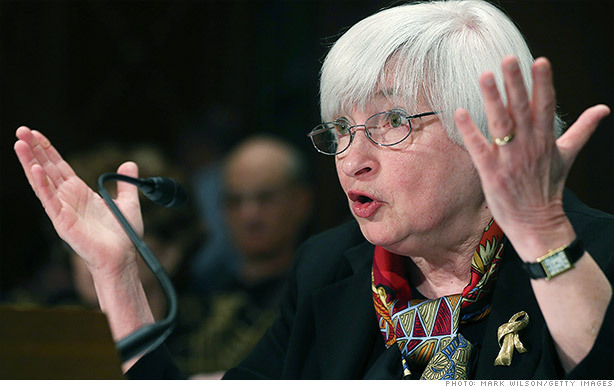 A prominent hedge fund manager was not happy about Yellen's performance. FOMC guidance is now so confusing and just reinforces what we've known for a while, they are completely winging it. One financial journalist noted that Yellen was probably doing a better job than the guy who had previously been President Obama's leading choice to replace Ben Bernanke would have. And another Yellen fan said she had fewer rookie jitters than her predecessor during his first few public appearances. Yellen is a far more confident and lucid speaker than Bernanke was at the outset. And some listeners were confused by Yellen's endless remarks about the Fed's so-called dot plot chart. Yellen: Don't look at the dots (which are clear). Focus on the statement (which is not). Why is everyone pretending to be baffled? Isn't Yellen just saying the unemployment and inflation aren't strong enough to raise rates? Can someone please ask Yellen why we should believe that inflation will drift upward during a period of mass unemployment? Ms. Yellen's employment dashboard will be key.But what is instrument panel? All vague,opaque, discretionary judgements.